It was the largest-biomass marine conservation victory in world history. And it was an ET campaign from start to finish. The problem: Strip-mining of the seas. Can you see what killed this dolphin? Neither could she. She’s part of the “bycatch” in the more than 20,000 miles of driftnet which was deployed nearly every night by the world’s largest and most destructive fishing fleets. This image is from ET’s first interception voyage, which stunned the world with images of “walls of death” and “strip-mining the seas”. It was an apocalyptic reality with no good end in sight, the largest and most destructive fishery in the history of the planet. It was rapidly destroying all pelagic life in the upper waters of most oceans of the world. It was untouched by treaties, unregulated, and deadly. It spelled doom for populations of whales, sharks, billfish, dolphins, seabirds, turtles and thousands of other species of “bycatch. This was the pelagic driftnet industry, a multinational fleet of roughly 1800 vessels which fished most of the year, deploying roughly 30,000 linear miles of gossamer, invisible “drift” gillnets every night, perpendicular to wildlife and fish migration routes. The nets, deployed at the surface and up to 50 feet deep, caught everything which couldn’t swim through a 3″ hole. Everything. Only the valuable part of the catch was kept and frozen, all else was thrown overboard, dead. These fleets were the “death star” of the planet’s large oceans, depopulating them of all large surface animals and fish which fed near the surface at night. There was no prospect of curbing them. When ET laid out its plans to the US National Marine Fisheries Service, its employees feared that we would make the fleet owners mad, and they might not get the 4 observers they were hoping to get. Beyond being an “impossible mission, this was a battle that was for all intents and purposes already lost. It was inconceivable that the momentum of the fleet could be stopped. 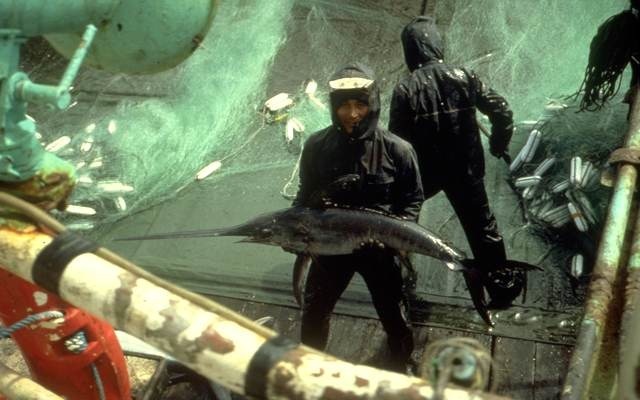 There had only been one other serious at-sea campaign dealing with pelagic driftnets, created by ET founder Don White when he was director of worldwide dolphin campaigns for Greenpeace International. 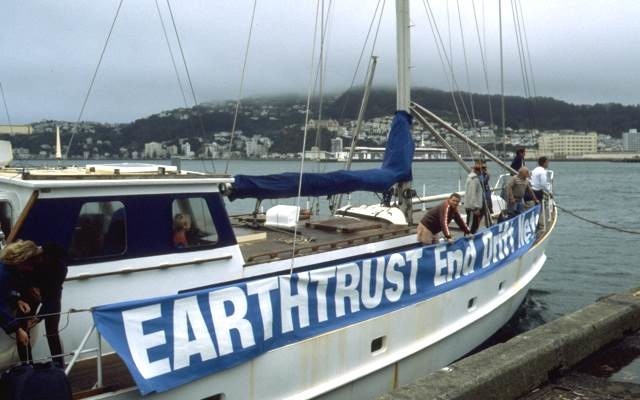 The crew of the first ET driftnet interception voyage, on the Sea Dragon, a 40-foot sailboat. 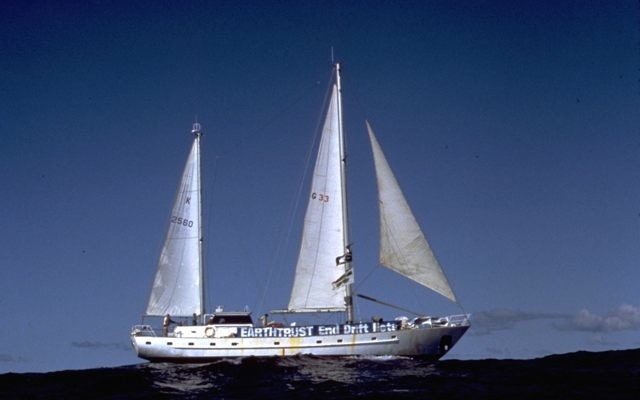 The modest vessel and crew were preparing to work a very sophisticated strategy to get images that nobody – even major world governments like that of the USA – had been able to obtain. So Don created a new plan to ban pelagic driftnets. 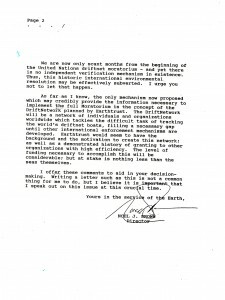 It would involve (1) intercepting the driftnet fleet in the north pacific with a small sailboat, and getting the photo and video documentation that no person, group, or nation had every gotten before. (2) Keeping tight control of these images with copyright, and using them to create a briefing video which would be widely distributed within the world’s other fisheries. In this video and accompanying materials, the concept “driftnetting” would be defined as large vessels setting in international waters. In this way the number of offending nations could strategically be reduced to three: Japan, Taiwan, and S. Korea. (3) Develop a movement to bring in nations to co-sponsor regional and national bans on the practice, and maintain the momentum. 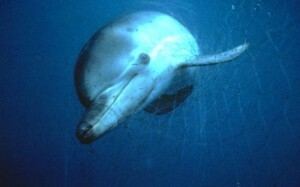 (4) Add driftnets to all dolphin-safety laws to reduce the market for tuna caught with driftnets. (5) Have marine scientists pull together the world most definitive briefing document on the impacts of driftnetting. (6) Deal with the blowback. It was considered impossible by everyone. The U.S. Government. Granting Foundations. Treaty organizations. Other NGO’s. Nothing on this scale had ever been accomplished as an environmental initiative. There’s no way to describe this multi-stage campaign here except briefly, except to say that ET pulled it off, each step executed and enabling the next. 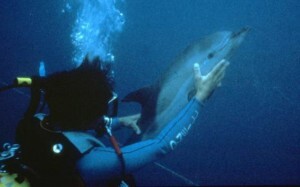 Sea Dragon crewmember, ET’s Jim Logan, pulling a young dolphin from an actively fished driftnet. Diver and videographer Sam LaBudde pulls a young dolphins from an active driftnet, thousands of miles from land in water miles deep. The net would fold over and nearly trap the ET divers, who needed to constantly cut one another free or be trapped with the other dead animals. Several months later, Don and Sam co-wrote and produced the video documentary “Stripmining the Seas”, which put the footage into context and introduced the world to the destructive fleets. 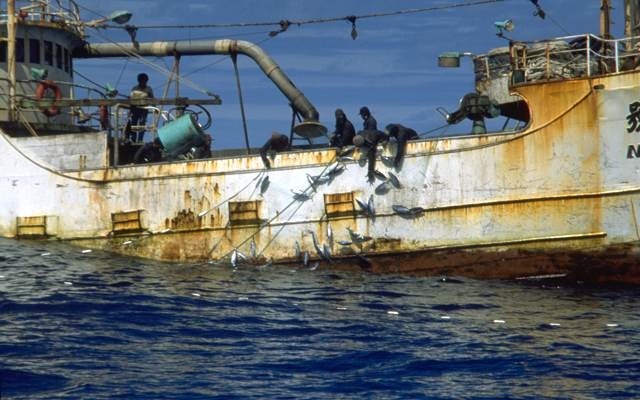 Tapes were made available “at cost”, and duping was explicitly allowed, and the fishing ports of the world were saturated with the documentary, which showed traditional fisheries being destroyed by the wasteful fleets. ET conducted a media and promo tour with the documentary, and started signing on fisheries organizations, states, and nations to ban driftnetting in their waters. Simultaneously, biologist Linda Paul and Sue White worked to pull together the world’s most authoritative scientific reference on the effects of driftnetting. There was immediate blowback by Japan, which funded a high-budget disinformation campaign through it’s media arm, Tele-Press Associates. 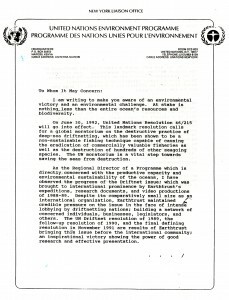 They created a veritable copy of the ET briefing video with an identical-sounding narrator, and began to push it around the world. So of course ET began work on another ANTI-disinformation video, with an aim at the United Nations. The ET message really caught fire in the South pacific, where there was already general dislike for the destructive fleets. Now, with images and the science behind them, it made sense to many nations to ban them. 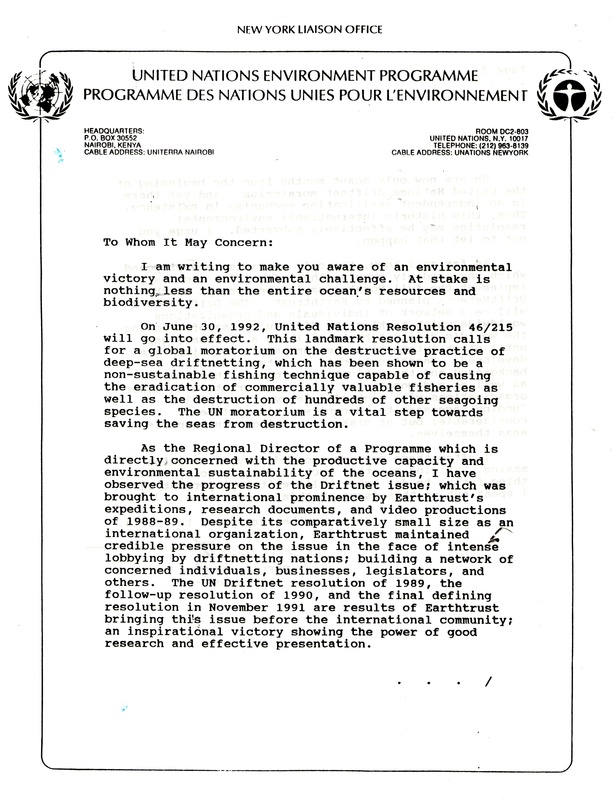 NZ prime minister Geoffrey Palmer took the ET tools and ran with them, securing regional bans and ultimately co-authoring the first United Nations resolution. Geoffrey subsequently joined the EarthTrust advisory board, and clearly and explicitly credited ET with pulling the issue together. The ET campaign ship Evohe, keeping the Tasman Sea clear of driftnet vessels while the regional bans were picking up steam. The final push at the UN saw all of us converging there with our new video production, and ET staff from all over the planet, to contend with a major lobbing push by Japan. We all camped out in New York at the ET office there, going to national delegations and answering questions one at a time, countering Japan’s high-budget pro-driftnet push. But in the trenches, it was clear that it was ET versus Japan. 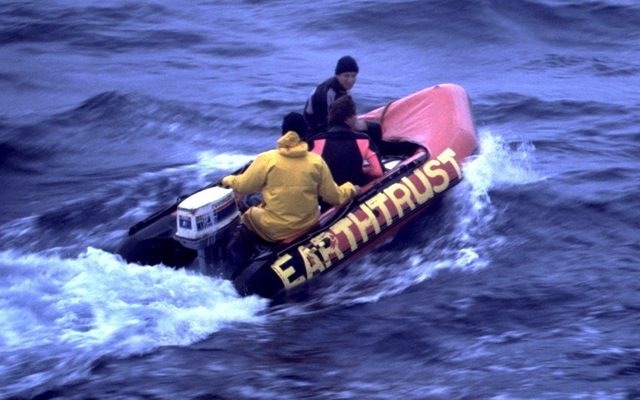 Indeed, one of Japan’s main pro-driftnet strategies was to try to discredit EarthTrust, since it considered no other organization a factor in the outcome. 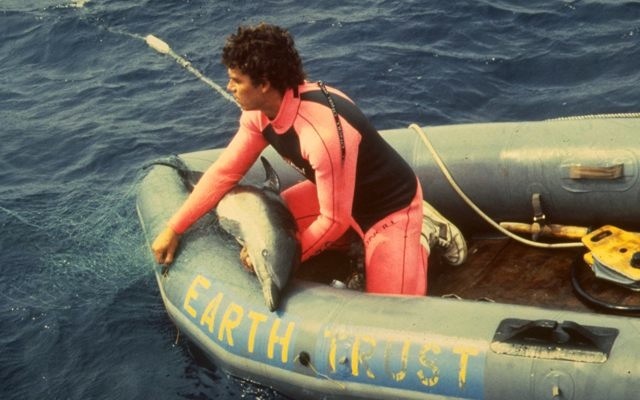 In the midst of this, Don was able to hold a press conference with the president of Starkist Tuna, the world’s largest fishery firm, announcing that its worldwide operations had contractually agreed to use EarthTrust standards in its tuna acquisition. When the dust settled, even Japan had to vote with the majority. 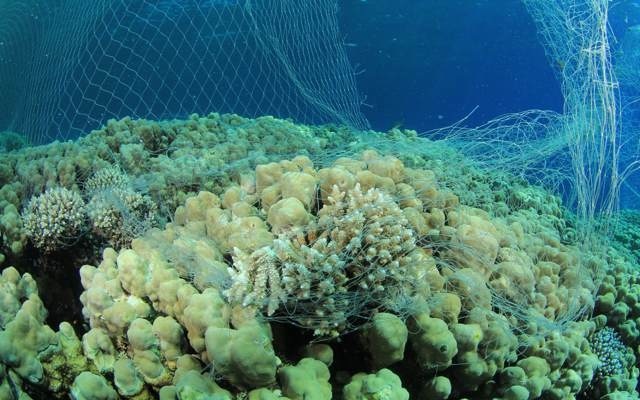 It seemed almost a fairy-tale victory in its completeness: a unanimous United Nations vote to ban deep-sea driftnetting. The fleets would be disbanded, the driftnetting stopped. This was almost certainly the largest-biomass marine conservation victory in world history. The fact that it was orchestrated from beginning to end by one small organization seems a bit unbelievable. The “death star” of the seas had been destroyed. 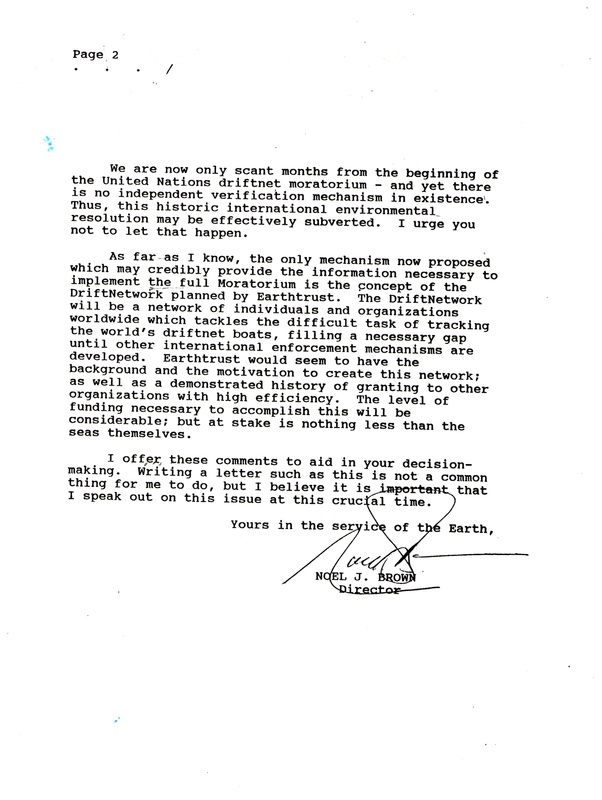 UNEP Director Dr. Noel Brown endorsed ET’s DriftNetwork as the entity to monitor the ban, and the enforcement ships of Taiwan came to Honolulu for inspection by Sue White of ET for the following decade. Analysis – This one seened pretty much impossible from all angles. It was huge, had billions of dollars and powerful nations behind it, was remote and impenetrable, had momentum, was not subject to any laws or treaties, and seemed already lost. There’s not even a remote chance it would have occurred without ET. From the sailing of the Sea Dragon in the summer of ’88, it was only three years from hopelessness to complete victory. A victory which has endured. The number of skill-sets, and the amount of intelligence and audacity it took to bring this off, were not possessed by any other entity. Conducting successful seagoing espionage campaigns, award-winning documentary production, organizing world fisheries, pulling together and packaging scientific research, and riding herd on a multifaceted international international PR and lobbying campaign. And the most important part: a human mind creating a workable stepwise strategy for the real world. In the end, the destructive fleet was disbanded and no longer sets its nets. And it taught an amazing lesson: even planet-scale destructive industry with enormous momentum can be turned around with a good enough plan. The amount of wildlife saved is really hard to estimate, except perhaps to say “all of it” in huge areas. The UNFAO estimated that over 1 million dolphins alone were killed each year by the fleets, so to the extent that’s accurate, one could figure roughly a million dolphins saved per year since 1991, which would make this victory the largest saving of dolphins in history. It is probably also the largest successful conservation intervention for sea turtles, sharks, seabirds, seals, billfish, salmon, tuna, some species of whales, and many rarer species. Now those ships weren’t all sunk. Many of them switched to other fishing techniques which are less-destructive but still unacceptably unsustainable. In 1988, a group of volunteers met in a beach house off Lanikai on Oahu. Don described to them the extent of the problem, and his plan to end it, using their volunteer energy. They were invited to think about the victory party when deep-sea driftnets were driven from the seas. 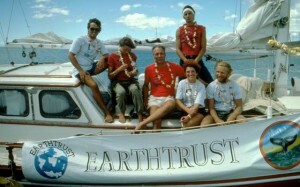 That party was held in 1991 on Waimanalo Beach, and attended by global leaders as well as ET volunteers. If it had been a movie script, it would have been considered too far-fetched to produce.